The Moxie Project encourages outside-the-box thinking to produce the most ambitious adventures. This includes their most recent Project, the inaugural Charlotte No Pants Light Rail Ride. 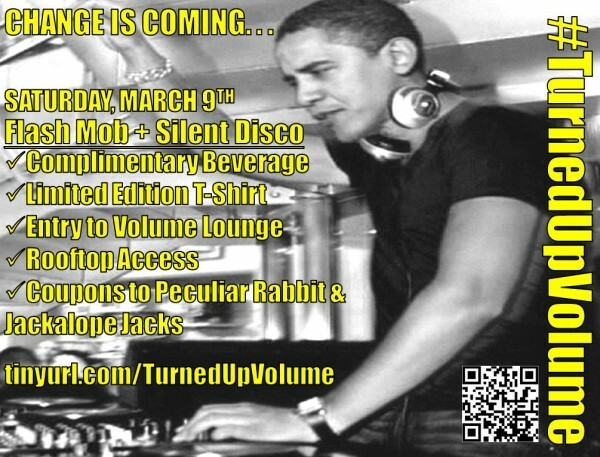 The organizers who call themselves “The Moxie Millennials” entice Charlotte’s progressives and innovators to attend #TurnedUpVolume on Saturday, March 9th. In keeping with ties to social consciousness, this time the mission will benefit local crowd-funding charity Doing My Part. This is an event made by Millennials for Millennials yet all are welcome. A social media connected, plugged-in generation needs an event which mimics its lifestyle. During congregation at Volume Lounge, attendees will await a secret email attached with an exclusive Mp3 sent to their mobile devices. At 11PM, participants will plug in their headphones to their smart phones and simultaneously play the Mp3 with high-energy music and playful activities. Think a silent disco meets a flash mob meets a dance party. The gathering will culminate on the rooftop of one of Plaza Midwood’s most prized buildings with spectacular view of Uptown skyline on a starry night. Afterward, DJ Citron will be spinning an eclectic mix all night at the after(dance)party. In the spirit of crowd-funding, organizers are promoting a crowd-sourced event. Organizers have asked attendees to submit their suggestions of what they would like to see/hear/do in the Mp3 on the Facebook event page. Ticket price will include entry, free dessert at Peculiar Rabbit, free appetizer at Jackalope Jacks, a limited edition T-Shirt, a complimentary beverage, and more!